Under the supervision of Trevor Hart and Judith Wolfe, Brett’s thesis is an interdisciplinary and diachronic exploration of the interface between the imagination and Christian apologetics, with particular attention to the writings of G.K. Chesterton and C.S. Lewis. 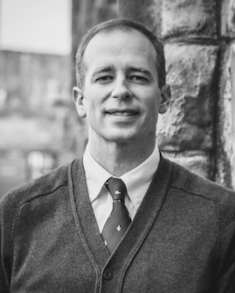 Research interests include the Theological Imagination, History of Christianity, Theology and the Liberal Arts, Cultural Hermeneutics, the History of Christian Thought, Natural Theology, and Apologetics. Prior to moving to the UK, Brett worked at the Marion E. Wade Center at Wheaton College as a graduate research assistant, where he conducted research for scholars, processed manuscripts and letters for archival use, and assisted in the editing of book reviews and articles for the journal, VII: An Anglo-American Literary Review. Currently, he serves as the Co-Editor of Book Reviews for the Journal of Inklings Studies and Editor for Transpositions: Theology, Imagination & the Arts. Brett and his wife, Amber, live in St Andrews, where they enjoy traveling, playing and watching sports, relaxing with good literature, music, and movies, and spending as much time as possible with their young son and daughter.